Saronsberg Cellar lies in the heart of Tulbagh valley, which in 1969 was the epicentre of the largest recorded earthquake in South African history. The farm consists of two portions, Welgegund and Waveren, each with its own distinctive terroir. Saronsberg uses modern technology in an innovative way, such as the forced cooling of grapes (the first South African cellar to do so), intensive hand sorting and the use of gravity during the fermentation process. The hands-on cellar provides the winemaker with many options, allowing them to focus on detail while expressing Saronsberg’s distinctive style of fruit-driven elegance. The farm’s unique terroir is ideally suited to Shiraz cultivation, and therefore Shiraz is Saronsberg’s prime focus. The cellar was opened in 2004. The Saronsberg Collection, a permanent exhibition of contemporary South African art, includes works by Angus Taylor, Rina Stutzer, Diane Victor, Walter Battiss, Lionel Smit, Paul du Toit and Norman Catherine, to name just a few. 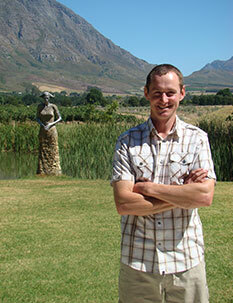 Saronsberg has been nominated as the Top Wine Producer in South Africa twice. Saronsberg continuously is recognised for its consistency. grew up on his father’s grape farm in the Swartland, and has always had a close affinity with the vine and its product.